Social parasitism in ants: effects of the inquiline parasite Plagiolepis xene St. on queen distribution and worker production of its host Plagiolepis pygmaea Latr. The ant Plagiolepis pygmaea forms polygynous (several mated queens per colony) and polydomous (multiple nests per colony) colonies that may be parasitized by the workerless social parasite Plagiolepis xene. Earlier laboratory experiments showed that P. xene strongly restricts host worker production (Passera, 1972); however, this negative effect seems not to occur under natural conditions. Here, we explored the hypothesis that, in infested natural colonies of P. pygmaea, parasite queens affect the distribution of the host queens resulting in the latter inhabiting unparasitized nests of the colony at the period of egg-laying. Our field studies show that the presence of the inquiline ant P. xene influences host queen distribution, with a higher level of dispersion within parasitized colonies. 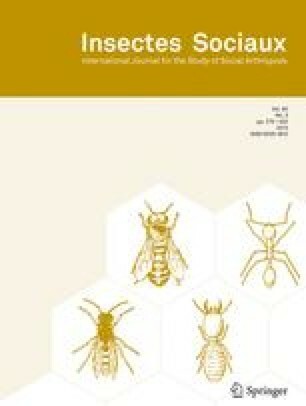 In winter, there is a positive association between the number of host queens and the number of parasites in queenright nests. Such a relationship does not occur in summer, so that when egg-laying reaches its maximum activity most queens of the host are found in unparasitized nests. Moreover, the proportion of queenright nests parasitized was dramatically lower than in the winter. A detailed comparison of worker production between parasitized and unparasitized field colonies reveals no difference. Experiments show that reduced worker production in parasitized nests reared under laboratory conditions results from oophagy by the parasitic queens. Overall, our data suggest that the segregation of the host and parasite queens in different nests at the time of egg-laying results in part from host queens avoiding inhabiting parasitized nests to reduce oophagy by the parasite. We discuss the behavioral and ecological implications of our findings. Key words: Social parasitism, spatial distribution, egg eating, Formicidae. Received 27 September 2000; revised 9 November and 13 December 2000; accepted 19 December 2000.